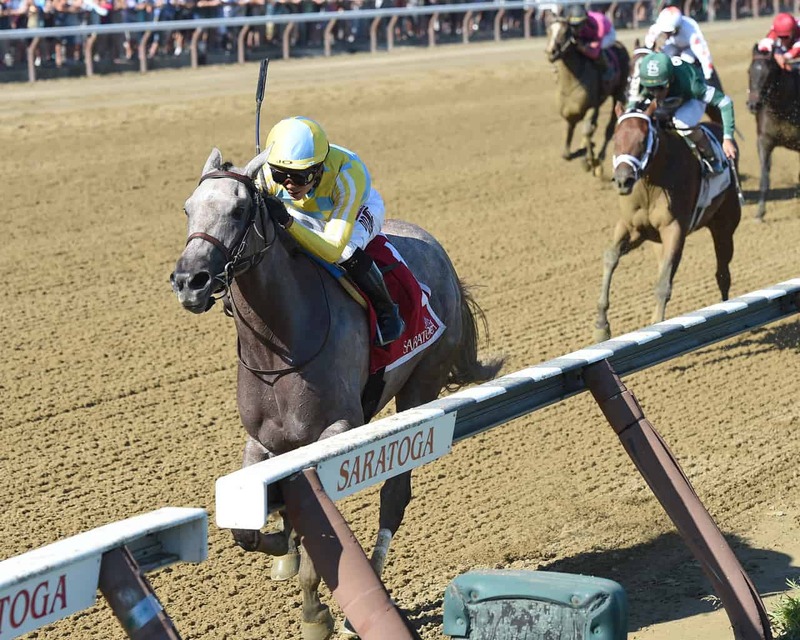 SARATOGA SPRINGS, NY – John Oxley’s Catherinethegreat broke the best and set an unconquerable lead on Friday to wire the 100th running of the Grade 3, $150,000 Schuylerville Stakes at Saratoga. Departing from the rail under Jose Ortiz as the second-favorite betting choice at odds of 3-1, Catherinethegreat took command and posted blazing early splits of :21.78 and :44.64 while never being pressured. Set down for the drive home while the field flanked four-deep behind her, the Mark Casse trainee took off with gusto in the stretch and crossed the wire 4 1/4 lengths the best in a final time of 1:09.98 for the 6-furlong main track event. Behind her, the 2-1 favorite Nonna Madeline was able to overcome a sluggish start out of the gate and edge Congrats Gal for second. Serengeti Empress was awarded a photo decision for fourth over Lady Apple and Eyeinthesky, while Fightress, Lonely Road, Tapping Pearl, and Blame the Frog completed the order of finish. Catherinethegreat’s win was her second in three career starts, having finished second on debut at Gulfstream Park on May 26 before breaking her maiden there on June 23. The daughter of Uncaptured, himself a multiple Grade 1-winning juvenile in 2012, has now earned $136,300 since Oxley purchased her for $170,000 as a yearling. Catherinethegreat returned $8.40 to win, $4.30 to place, and $3.60 to show. Nonna Madeline brought back $4.30 to place and $3.40 to show, while Congrats Gal paid $7.50 to show.